I am so fortunate to be part of a warm and wonderful kitty community here online. I am reminded of this every holiday season. Before she takes them down this weekend, I wanted to make sure that my human took a photograph of the snail mail cards I received from many of you. This door is right next to my cat tree — and it separates the dining room from the entry and upstairs living room. So every time I come down for dinner or a snack, I go right by these cards! I get to look at them several times a day. And thank you so much, those of you who bought my calendar after yesterday’s post! I hope you enjoy them. I only have three left! So if you still want one, you can order it here. Here’s hoping you all have a very Happy 2012. Peace and Love for all is the wish of the 6 Mouskateers for everyone on the Blogs. We hope all are safe and Happy! Happy New Year Sparkle! It was a joy sharing the cat blogosphere with you this year and I really enjoyed meeting your human at the Cat Writers Conference!!! Happy New Year to all of you. May 2012 bring much peace, love and purrs of happiness! We enjoy getting cards from our friends too. We have told mum to take a photo of them before she takes them down. We are very glad your calendars are selling, Miss S. They are quite beautiful. We loved getting all the different cards this year. It was so fun. We hope it’s an annual tradition and we really appreciate Huffle making the effort to volunteer and compile a listl. OH! And Mommy downloaded your first book on her Kindle Fire…it’s GREAT! Sparkle, we are very happy to be friends with you! And you know what? WE got three times as many cards as Mommy & Daddy! As it should be. we’ll check out that calendar of yours. Good thing ALL of your friends didn’t send cards or you would need lots more doors! Those are great cards. I did not get many this year but then I did not send any–and well our address changed so I am certain many of our friends did not send them. Lucky you to get so many cards! You are blessed to have so many friends! Glad to hear the calendars are selling! Happy Mew Year! We didn’t get cards out this year because our mommy didn’t get a chance to (she’s a slacker) but we love the one of Binga! 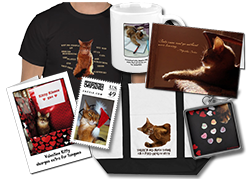 We think the blogosophere is filled with so many wonderful, caring kitties and their humans especially you and your human, Sparkle! 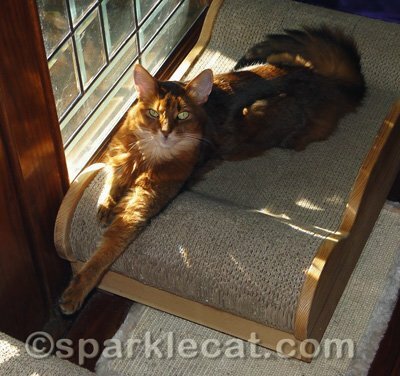 Sparkle, that is a very fetching pose! You look marvelous dahling! We got more cards than our human also! hehe. Good going Sparkle. I hope you got more cards than your humans. I know I did. Anipals are the best! Glad you’re gonna at least break even on your calendars. Happy holidays, Sparkle! I’ve only been a part of your community for six months or so, but I’ve loved every minute! Thanks for being you, pal. Happy 2012 to you as well…..we are so glad we have gotten to know you! We loved all the cards we got too, Sparkle! 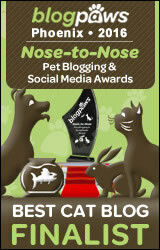 We love all our furiends in the blogosphere! A lovely display, Sparkle! Good going on the calendars and we couldn’t agree more about our friends here on the web. We were surprised how many cards we received too. We are glad to hear you sold most of your calendars – we hope you sell the rest today. We totally agree with you Sparkle. The blogging community is just the best. Those are some mighty cute cards for sure. We got a lot too. It is fun. Hope you have a great week end and a very Happy New Year. 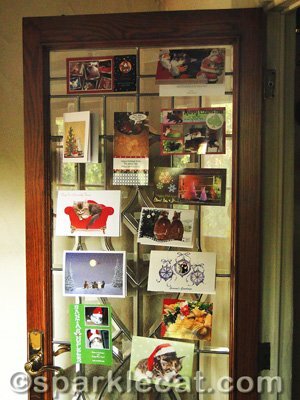 We loves our cards too – it’s such a warm cozy feeling to be surrounded by all our wonderful friends. Those are a lot of cards! And well done on getting more of your calendars sold. I hope the 3 will sell out before the year end.